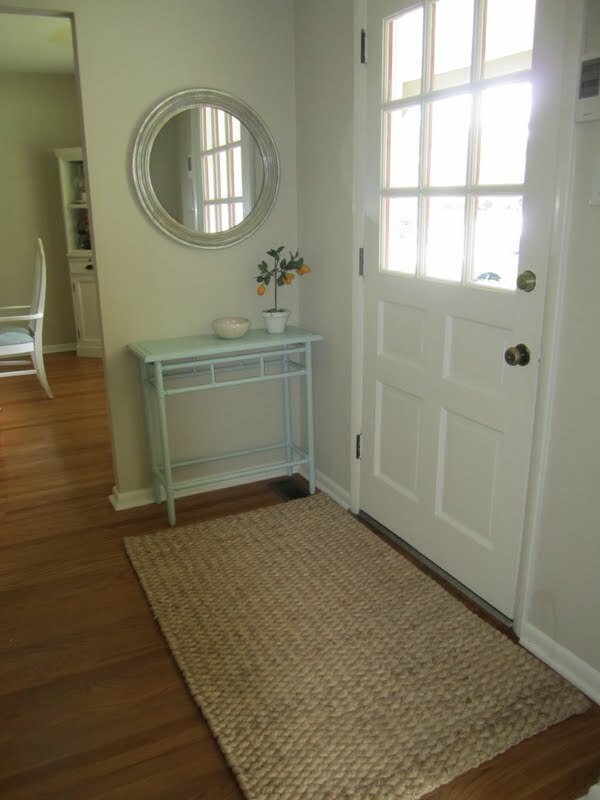 As soon as I bought the chunky jute rug for my entryway, I was inspired to keep going and spruce up the area. I am held back a bit by paint ... I want to do it soon, but I'll need a big chunk of time to devote to it. And that staircase needs attention. 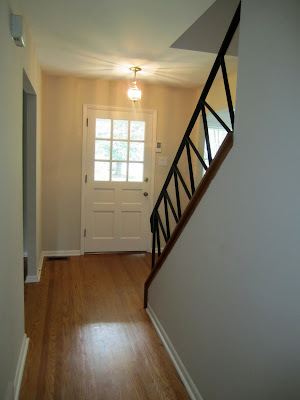 I want to paint those risers white and replace the banister and spindles with something much more my taste: white wood! I'm pretty sure I will do that in the Winter. And finally I want to get a drum shade and just use our current entryway light fixture but remove the glass, paint it silver and add the shade. 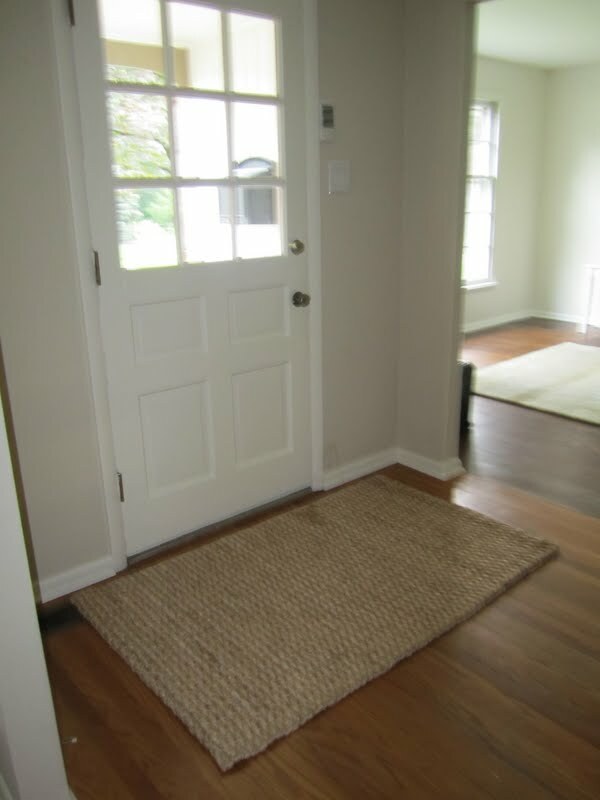 Here is my entryway before I got started. The rug really helped define the space and I realized I just might be able to find a table to fit behind the door. 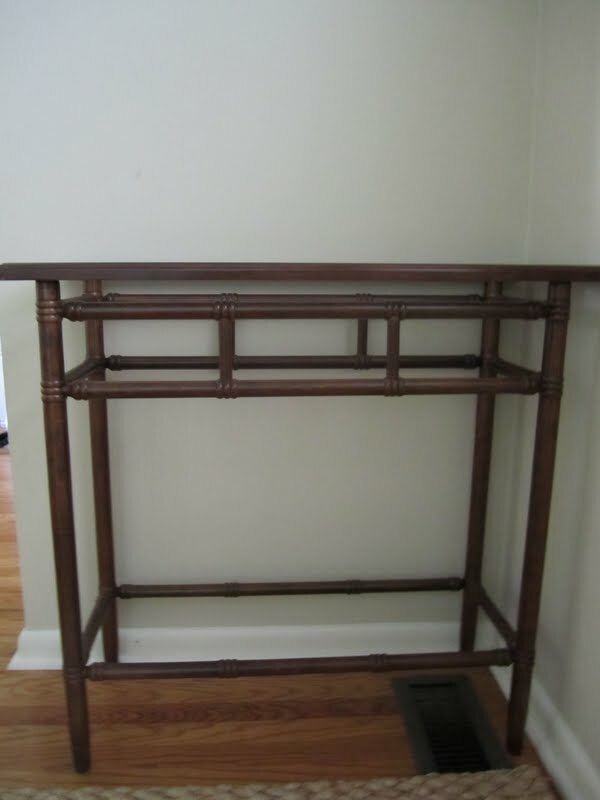 I was on Craigslist and happened to find the holy grail: a small, chic table that was the perfect size for my entryway: I loved that it looked like bamboo but was actually wood. And $20. The only problem was it was missing its top. But I knew I could easily fix that with some plywood from Lowe's. So I snatched it up! Here it is when I picked it up. You know me: I was not digging the finish on the wood. First thing I did was measure the table-top opening. I went to Lowes and found a piece of birch plywood for $7 and had them cut it for me down to size. I got it home and used some liquid nails to glue it down. Next step: I used some paintable caulk in the groove between the plywood and the table edge. This only took a minute. Then I primed the table. I used my favorite oil based primer. It took a lot longer than I thought because of all the curves and bamboo details. Once it was primed, it was time to paint! I went back and forth about the color: should I paint it a soft greyish blue? What about my favorite Dover White? Ooh, what about going in a different direction and bringing in a punchy teal or turquoise? In the end, I was inspired by some pretty blue pieces that I saw at the shore and decided to give a soft greenish-greyish blue a whirl -- it's almost a seaglass color. If I want a change, I can easily paint it again. I went with Waterscape by Sherwin Williams and had Lowe's match it to their Valspar paint. 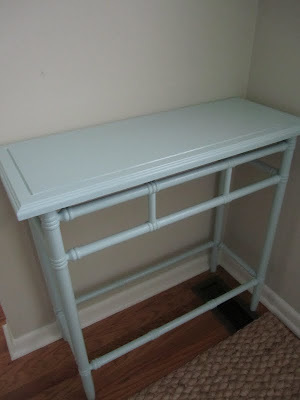 It took two coats of the latex paint and then two coats of water based Polycrilic. Here's the table finished. Doesn't it look cute? How about a detail shot? I moved the big round mirror from the half bath that our sellers left behind and put that over the table. Right now it's a distressed silver, but I am not sure whether to keep it or paint it another color. I welcome suggestions! I added a few accessories, but I need some more. 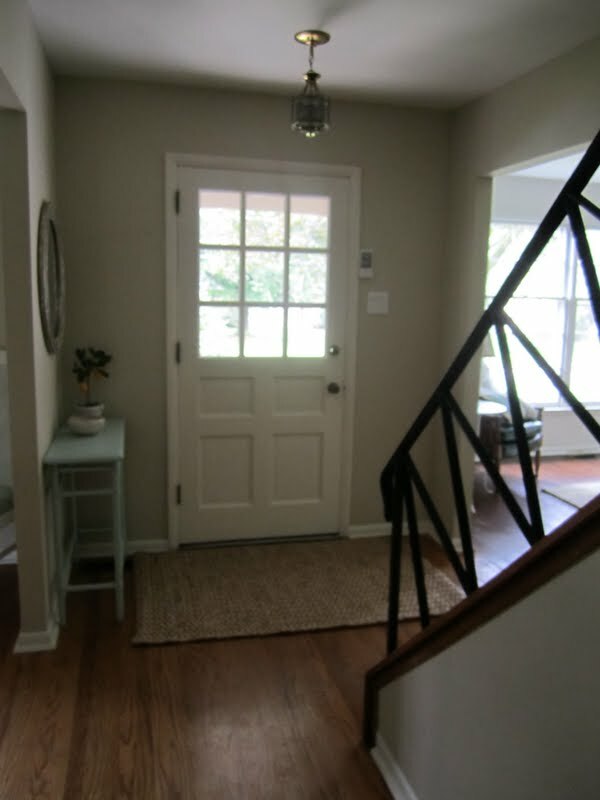 So here is the entryway now from all different angles! Much better than the stark city it was before. Now we have a place for our keys as soon as we walk in the door [hint hint, husband, hint hint: put your keys down in the bowl when you walk in the door]. This room is shaping up! And the hunt for the perfect size & color drum shade for that overhead light goes on. WHEN do you do these things?? I love that table Shanna!!! 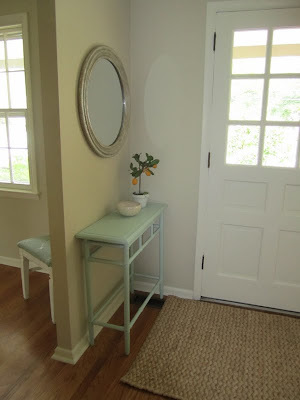 It is so coastal looking, and I love that new rug in family room!!! You are so, so resourceful and man do you get a lot done!!!! 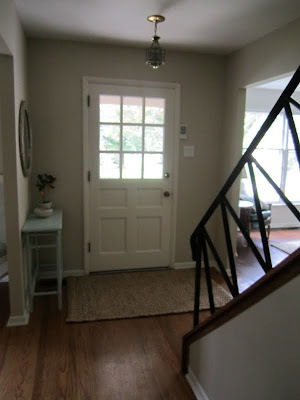 I missed seeing what you are up to in your new beautiful home, so I will be snooping the blog for a while!!! 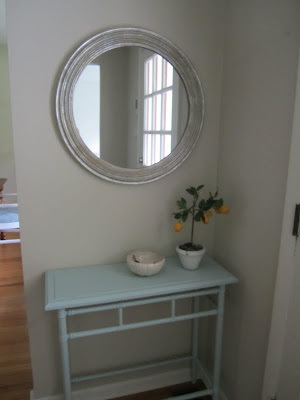 Love your little table - wish I could find something like that for my place! Thanks everyone! I love it too and can't believe how perfectly it fit in that little space! !